SINN FÉIN HAS has confirmed it will hold its Ard Fheis on 22 and 23 April, with leader Gerry Adams to deliver a televised address to the nation on the eve of the 100th anniversary of the Easter Rising. The party confirmed this morning that its annual gathering is scheduled to take place at the Convention Centre in Dublin. Adams will give his live keynote address at the conclusion of the conference on RTÉ television on Saturday, 23 April at 8.30pm. The news is likely to delight Sinn Féin members as the address will fall on the day before the 100th anniversary of the Rising which began on Easter Monday, 24 April 1916. Sinn Féin is planning a number of events on the anniversary itself with a reading of the Proclamation due to take place outside the GPO on O’Connell Street. The party had originally pencilled in its Ard Fheis for 5 and 6 February. However, the expectation that Taoiseach Enda Kenny will call the election before then meant Sinn Féin stood to lose out on television coverage because of broadcasting rules during election campaigns. Now the two-day event in April is also likely to provide a perfect opportunity to showcase its new Dáil representatives with the party widely expected to increase its number of TDs in the election, which is expected to take place next month. Ahead of that election, and after Fianna Fáil’s one-day event in Citywest on Saturday, Fine Gael gathers at the same venue this Friday and Saturday for its Ard Fheis. Labour will hold a one-day conference in Westmeath on Saturday, 30 January. Email “Gerry Adams will speak to the nation on the eve of the Rising centenary ”. 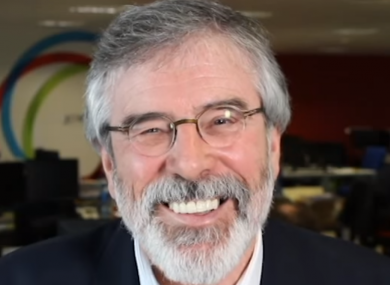 Feedback on “Gerry Adams will speak to the nation on the eve of the Rising centenary ”.